Few lessons in American journalism are as inspiring — but, in the end, as misplaced — as the notion of Edward R. Murrow’s slaying the dragon of McCarthyism in a single television program in 1954. 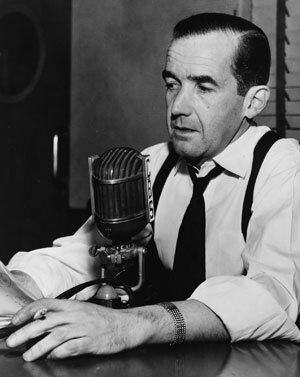 It’s a great story, how Murrow, the legendary figure of American broadcasting, stood up to Senator Joseph R. McCarthy, when no one else would, or dared, and in so doing, brought an abrupt end to senator’s witchhunt for communists in the U.S. government. It’s a tale that dates to the evening of March 9, 1954, and Murrow’s “Special Report on Joseph R. McCarthy,” which aired on the CBS television show, See It Now. The epic confrontation of Murrow and McCarthy was recalled the other day in a commentary posted at the online edition of a Philipine newspaper, the News Today. It is a great story; indeed, it’s one of the most treasured in American journalism. But as I write in my forthcoming book, Getting It Wrong, the notion that Murrow took down McCarthy and ended the senator’s witchhunting ways is a tenacious media-driven myth, one that obscures the more important contributions of journalists other than Murrow in McCarthy’s demise. Pearson’s contributions to unraveling the scourge of McCarthyism are, however, little recalled these days. Interestingly, the media myth of Murrow v. McCarthy took hold despite the protestations of its central figures. In the days and weeks following the See It Now program on McCarthy, Murrow said he recognized his accomplishments were modest, that at best he had reinforced what others had long said about McCarthy. So why has the Murrow-McCarthy myth become so tenacious? There are several reasons. A particularly persuasive explanation, in my view, is that mythologizing Murrow’s See It Now program on McCarthy serves, as I write in Getting It Wrong, “to affirm television’s sometimes-tenuous claim to seriousness of purpose. Besides, it wasn’t as if Americans in early 1954 were hoping for someone to step up and expose McCarthy, or waiting for a white knight like Murrow to tell them about the toxic threat the senator posed. It was quite well-known by then.